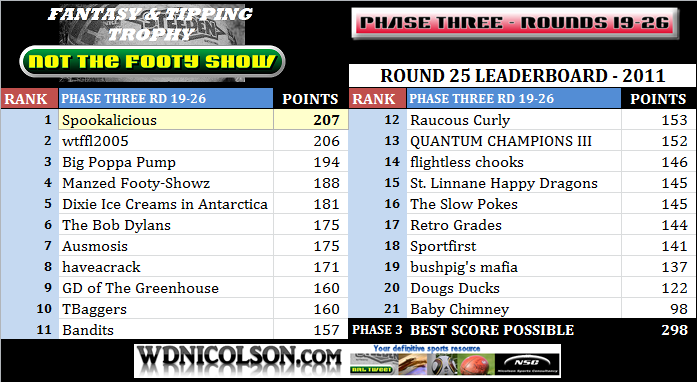 The Leaderboard went silent as of Round 19 and the votes for Round 25 and 26 will also go silent ahead of the @NRLTweet Player of the Year Awards Show on Monday 5th September at 7:30pm. Welcome to Season 2011... after an off-season that often feels longer (or shorter - depends if you like cricket or not) than it is - the footy is back. Here on www.wdnicolson.com we've got all the Tuesday Team News, Wednesday or Thursday Game Previews and Friday Late Mail (sourced from SMH and beyond) that will keep your Tipping and Fantasy habit well fed. 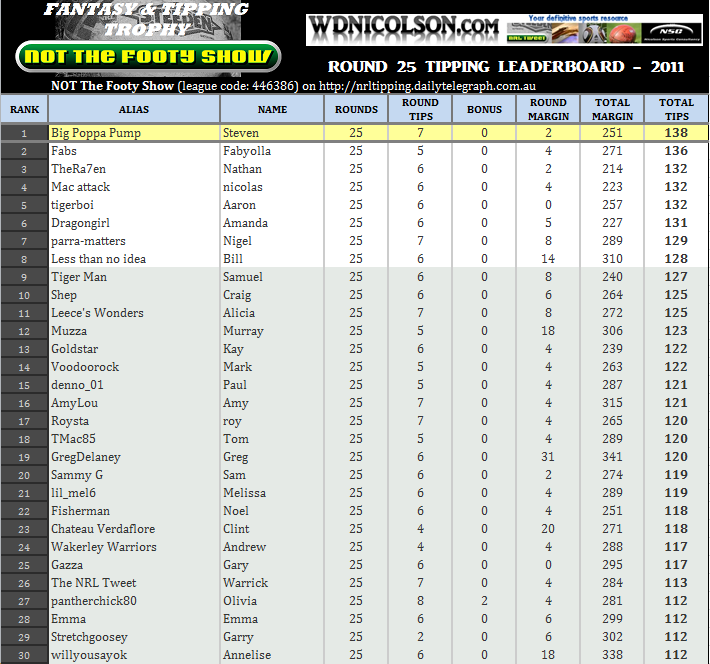 This preview integrates our NRL Injured List - which if you haven't bookmarked by now - I suggest you do so. 8th KNIGHTS TEAM RECORD 11-12 for 26 Points, +19. 9th RABBITOHS TEAM RECORD 11-12 for 26 Points, -15. KNIGHTS 6 RABBITOHS 4 - Souths won 28-10 at Bluetongue in their last meeting but that was in Round 5 last year. SMH and Other Late Mail 02/09 - The Bunnies may not risk Roy Asotasi this week, but Nathan Merritt (quad) and John Sutton (hand) will likely play tonight. Sutton will play with pain-killing injections. The Knights will have Matt Hilder and Adam MacDougall, with Zane Tetevano, Mark Taufua or Cameron Ciraldo dropping off the bench. 01/09 Sports News First is reporting... John Sutton and Nathan Merritt will play after coming through Thursday's session without complaint. Adam MacDougall and Matt Hilder are expected to play. RABBITOHS To Win By 1 Point. 6th DRAGONS TEAM RECORD 13-9-1 for 31 Points, +122. 11th PANTHERS TEAM RECORD 9-14 for 22 Points, -67. DRAGONS 7 PANTHERS 3 - Penrith upset the Dragons 12-8 in their Round 17 clash in 2010 but the Dragons had won 6 straight before then. Penrith last won in Wollongong in 2006. SMH and Other Late Mail 02/09 - There remains some chance that Trent Waterhouse could join Petero Civoniceva in the team despite both not being named on Tuesday. Civoniceva will almost certainly play, while Waterhouse remains in doubt. Mitch Rein looks set to play at the expense of Adam Cuthbertson. BREAKING: Waterhouse and Civoniceva WILL play, and Michael Jennings is some hope despite a shoulder injury. 01/09 Sports News First is reporting... Petero Civoniceva will play after training on Thursday. DRAGONS To Win By 10 Points. 7th WARRIORS TEAM RECORD 13-10 for 30 Points, +99. 5th COWBOYS TEAM RECORD 14-9 for 32 Points, +64. WARRIORS 4 COWBOYS 6 - The Cowboys won 30-10 in Round 15 at Dairy Farmers. The Cowboys have won 5 of the last 7 going back to 2007. SMH and Other Late Mail 02/09 - The Warriors could bring Lewis Brown in at centre for Shaun Berrigan who is struggling with a hip injury, while the Cowboys lost Dallas Johnson to concussion. Leeson ah Mau is the new face in the squad. A gastro bug hit the Cowboys during the week but they should have recovered by Saturday. Matt Scott's back injury won't keep him from playing. 01/09 Sports News First is reporting... Dallas Johnson did not travel with the Cowboys due to concussion, with either Cory Paterson or Scott Bolton to replace him in the starting side and Leeson Ah Mau may be added to the bench. Player of the Year Voters: Matthew Vickers and Craig Buchanan. 13th SHARKS TEAM RECORD 7-16 for 18 Points, -121. 4th TIGERS TEAM RECORD 14-9 for 32 Points, +81. SHARKS 1 TIGERS 9 - The Tigers have dominated this clash for years. They have won the past 2 and 9 of the last 10. WTG: Moltzen, Ryan, Ayshford, Utai, Tuqiri, Marshall, Lui, Gibbs, Farah (c), Galloway, Fulton, Ellis, Heighington. Bench: Brown, Flanagan, Groat, Woods, Murdoch-Masila. SMH and Other Late Mail 02/09 - The Tigers should get Bryce Gibbs back from a lacerated knee for this one, while Todd Payten won't return until the Finals. Mark Flanagan or Ben Murdoch-Masila will drop out. The Sharks hope Dean Collis can play after missing last week with back spasms. 01/09 Sports News First is reporting... Jeremy Smith has a virus but should play. Ben Pomeroy is on standby for Dean Collis (back). 15th TITANS TEAM RECORD 6-17 for 16 Points, -246. 16th EELS TEAM RECORD 5-17-1 for 15 Points, -173. TITANS 4 EELS 2 - Parramatta won 22-18 in Round 7 at Parramatta Stadium and have won 2 of the last 3 since 2009. SMH and Other Late Mail 02/09 - The Eels took Tim Mannah to the Gold Coast but he remains in serious doubt with a hamstring injury. Rory Brien would likely join the NRL squad from Toyota Cup if Mannah can't play. Esi Tonga is out and replaced by Ben Ridge for the Titans. 01/09 Sports News First is reporting... The Titans lost Esi Tonga (Hand) and will bring Bodene Thompson into start at centre and Ben Ridge onto the bench. Player of the Year Voters: Nigel Wilbow and Greg Delaney. TITANS To Win By 1 Point. 10th BULLDOGS TEAM RECORD 11-12 for 26 Points, -54. 14th RAIDERS TEAM RECORD 6-17 for 16 Points, -186. BULLDOGS 5 RAIDERS 5 - Canberra shocked the Dogs 20-12 in Round 11 in Canberra and won at ANZ in Round 23 last year, but the Dogs had won 3 straight before then. SMH and Other Late Mail 02/09 - The Raiders will carry at least two players into the game needing surgery with Josh Dugan (Ankle) and Shaun Fensom (Shoulder) requiring off-season surgery. Canterbury's Trent Hodkinson should play despite his corked calf. 01/09 Sports News First is reporting... Trent Hodkinson's corked calf shouldn't stop him from playing. BULLDOGS To Win By 16 Points. 3rd BRONCOS TEAM RECORD 17-6 for 38 Points, +131. 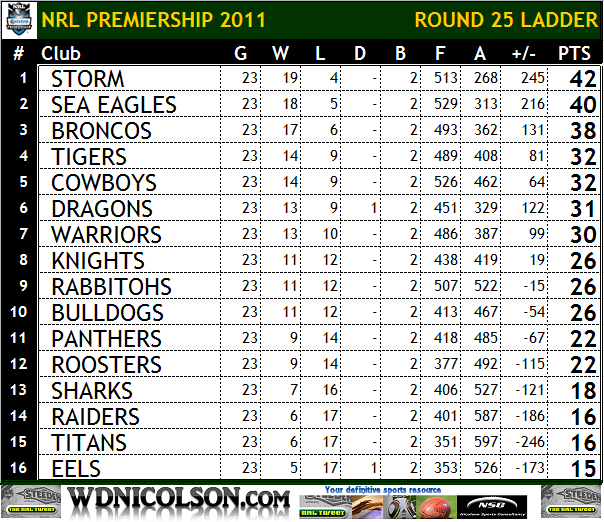 2nd SEA EAGLES TEAM RECORD 18-5 for 40 Points, +216. BRONCOS 4 SEA EAGLES 6 - Brisbane were flogged 34-10 at Suncorp in Round 12 as Manly shifted their game from Brookie for a post-State of Origin double header. In fact Brisbane have won just one of the last 6 games going back to 2007. SMH and Other Late Mail 02/09 - The Sea Eagles will be without Glenn Stewart for 3 games through suspension, Joe Galuvao will move to the backrow and Shane Rodney or Anthony Watmough will play lock. George Rose will probably start, with Tim Robinson getting a run on the bench. The Broncos won't risk Justin Hodges until the Finals. BRONCOS To Win By 6 Points. 12th ROOSTERS TEAM RECORD 9-14 for 22 Points, -115. 1st STORM TEAM RECORD 19-4 for 42 Points, +245. ROOSTERS 3 STORM 7 - The Storm won 21-4 despite being heavily under-manned in Round 14. Melbourne have also won 4 of the last 5. SMH and Other Late Mail 02/09 - Troy Thompson replacing Jesse Bromwich (elbow) is the only change likely in this one. There was a report that Maurice Blair's shoulder injury will keep him out for the rest of the season. 01/09 Sports News First is reporting... Jesse Bromwich is still no certainty with an elbow complaint, Troy Thompson could come into the 17. 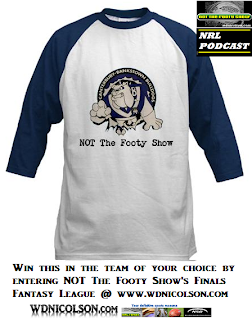 ]-[ There is just 1 week left in NOT The Footy Show's Tipping Competition and the outright winner walks away with an Official Steeden Match ball.